My place is being over run by snakes.....what do I do? Jawa, snakes live in rocks. Tim King: correct, not dangerous snakes. Scary snakes. There are freaking mice everywhere. We have cleaned up everywhere we can reach. I am pretty sure the mice are living behind my stalls. Ambitious Kate: I do understand that the snakes are coming into my space to eat my mice & toads. I don't know how to get rid of my mice anymore. We have cleaned everything we can get to. I have personally seen the garden snake 2x in my barn & 1 time in my driveway, my boarder has seen the luttle snake 2x in the barn, my hisband 3x. I have seen the black snakes everytime I have been in my hay shed-however no one else has seen them. I did not see the brown snake personally-he has so far, only been seen today. Sounds like you need barn cats to get rid of the mice. We just buckled down and got 2 feral kittens now 18 weeks old. We have seen NO snakes but do have mice. Got tired of cleaning up mouse poop. (our food is sealed and has been a long time) The feral cats are in a large crate still, now in our barn aisle and since we put the cats in the barn, we have seen NO mice. Zero. We used to see 2-3 a day. We haven't even let the cats loose yet. I would get cats. Deal w/the barn mice and the snakes will probably go away. If these non-poisonous snakes prevent you from getting things done, then you might do best to have an exterminator advise on the most effective strategy for eliminating the vermin. There are piles of crickets around my house and barn right now and I occasionally see garter snakes. I have to think the crickets are part of their food supply. Short mowing won't affect the crickets, but it will deter the mice and snakes a bit. No offense, but I think you need to work a bit on coexistence. I hate getting poked with needles but I'm a lot better about it. I sympathize. I am phobic about spiders but don't mind them at barns. I do however mind snakes when they're outdoors and I don't know what kind they are. I found these for you, OP. Maybe they will help you feel more like your name. I Googled "get rid of snakes" and "get rid of snakes Michigan." No offense taken, I am working on de-sensitizing myself-but it's a long road for me. I can finally not run away screaming (like a little girl). I now turn and walk away quickly. The one in my driveway, I was able to stand 5 feet from it for almost 10 minutes before the heebie geebies got the better of me. We are working on sealing up some holes we found in the base of the barn. But, with the weather to hot my doors are all open so it won't to to much. How high can snakes climb anyway? I've seen snakes climb up and down my friend's loft ladder...just a warning! unless the snakes are venomous, you really don't have a problem. most snakes are very placid - nonviolent enough that your dog was able to come up to them and they didn't do anything. that's not a sign of aggression - lots of snakes around here play dead or do nothing to avoid a potential curious predator. snakes are very shy, even the venomous ones - as children we used to prowl under tires and rotted logs and would handle the snakes and never once got bitten. not a lot of snakes out there that carry zoonotic diseases, so on the horse front i think you'd be okay. snakes are actually incredibly beneficial to farms. they are actually incredibly clean as far as vermin go - they are not destructive - and they actively compete with other animals on the food chain that are much more destructive than mice. i'd much rather have snakes than rats - snakes will not destroy your barn or give your horses various diseases. here we have a rat problem.. i love domestic rats so poisoning these critters is out of the question. what i wouldn't give to have some snakes though.. for some reason they have never really come down to the barn. Hire St. Patrick! That was his famous thing right? Kicking all of the snakes out of Ireland? Teasing aside, I don't know, but I can very much sympathize with you. That's tough. I think we have a few snake round-up/wrangler experts on here. If you can find the thread "This is why they spook at logs" (or something like that) their names will come up in the the thread, perhaps PM them? St. Patrick actually drove the Pagans out of Ireland...by killing them. They were referred to as snakes. OP, maybe you could get some counseling for your phobia. The kind of snakes you have are harmless. Set everything on fire and move. I'm with you, I hate snakes!! But... what if the snake were holding a carrot stick with a plastic bag attached, would that help? Ok, that's hella not cool. Ever since I was a kid, I'd wondered what he had against snakes. I thought it was that whole garden of Eden thing. Another childhood myth bites the dust. I think cats r good at keeping snakes at bay.....do you have any cats? Keeping everything well manicured/mowed seems to cut down on snakes. They can't hide in short grass when moving from place to place, so they just stay where the grass is long. Keep the grass mowed, and all "edges" along buildings & fencelines trimmed short, and they will move on and not come back. Our cat loves snakes. She brings them into the house, sometimes in varying states of aliveness. Also a "dead" snake on the kitchen floor sometimes turns out to be an alive snake that was just resting. I am glad you're working on desensitizing. 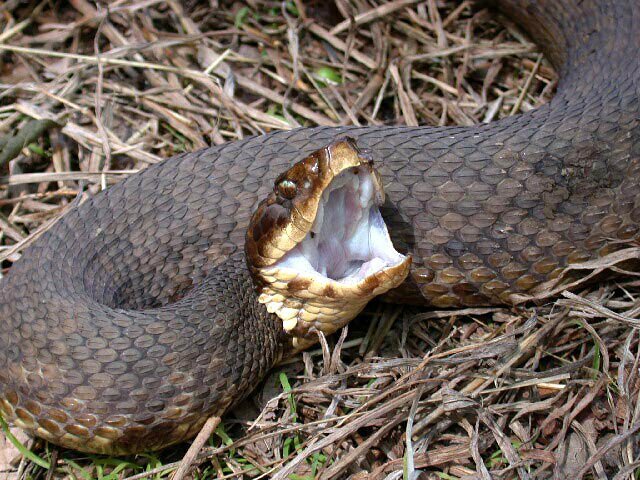 For our area, that wouldn't be an abnormal number of snakes at all (we get ring necks and browns, most commonly). The only thing unusual here would be them hanging out in the barn that much, since you are keeping it clean. What size are they? Snakes and small mammals are a thing, sure, but they also eat insects, amphibians, and other reptiles (including other snakes), so there could be multiple food sources drawing them into the barn. You might need to pull down the kick boards to get to mice nests (or hire an exterminator). If you think the snake problem is bad now, if you have a mouse problem being controlled by snakes the mice are going to explode over the winter! Snakes can climb very high, as in up into the rafters. Take a class in herpetology, that will get you over your fear and help you identify snakes, it worked for me anyway. 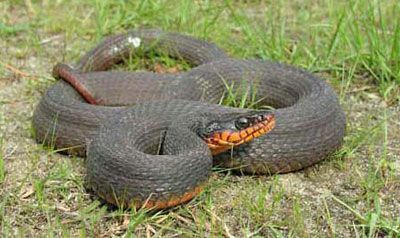 Make your yard not snake friendly; keep grass cut very low, remove low shrubs and shady places snakes might like to hang out, don't have any shrubs or plants around the house or barn. Don't have stacks of wood or anything that would make a nice place for them to hide. Get rid of the mice, that's your #1 problem. So mowing the grass shorter than normal will detour them at least a little? Around here, we say that keeping the grass short just allows you to see them coming. Also, I have never, ever known of a snake chasing a person. They just don't do that. Maybe not, but I have sure had some of these and even more of these evidence a strong desire to occupy the same square foot of swamp as I, with celerity! When we had a mouse and rat problem, a big group of black snakes arrived to enjoy some rodent meals. After the foxes moved in and killed all of the rats and most of the mice, most of the snakes moved on. I wish there were a way of attracting some foxes, but you probably have to get rid of the rodents yourselves.